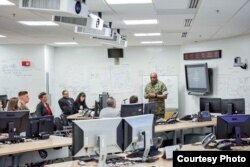 In the straight-laced world of the U.S. military, the big room with glossy white paint stands out. Beyond the desks lined with computer screens, the overhead projectors or the digital clock displaying the time in various world cities, the walls demand your attention. 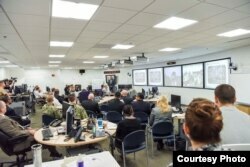 They are covered from floor to ceiling with questions, equations, sketches and ideas — scribbled frantically or in moments of inspiration — all representing the best thinking of some of the U.S. military’s best analysts. “There are precious few places in this building where you can write on a wall,” said Albert Bolden, not surprisingly given that this is, after all, part of a military base. But according to Bolden, the director of innovation at the U.S. Defense Intelligence Agency, that’s part of the point for the so-called Innovation Hub, or iHUB. “People from across the agency can come into this space and figure out how to solve our problems,” he said. While all this may sound like a feel-good tale of military structure melding with Silicon Valley ingenuity to make life easier by using technology, it is actually about much more. And Stewart was clear. It is, in many ways, an arms race. “Our adversaries have been modernizing,” he warned, speaking to a small group of reporters in August, as the agency welcomed private companies and academics to the iHub for a series of so-called Industry Days. And it is these encounters between the DIA’s own top thinkers and some of the best outside of government that form a second, crucial component of the iHub strategy. It is a chance to see how off-the-shelf technologies might be able to help solve problems the agency’s analysts have identified. One company making a pitch to be part of this overall effort is an Austin, Texas-based artificial intelligence start-up called SparkCognition. SparkCognition already has attracted interest from the U.S. Air Force. And companies like Verizon and Boeing are now investing more than $30 million in the company's neural networks, designed to mimic the functionality of a human brain in order to predict likely outcomes. “What we’ve done is automate that research that a data scientist would do,” said SparkCognition’s Sam Septembre following a question-and-answer session at the DIA’s iHub. Instead of taking weeks or days, however, Septembre said SparkCognition’s systems can deliver results in hours or even minutes. “The human factor got involved and skewed it,” said Stefanick, explaining that some predictions ended up being wrong after human analysts did not trust the initial results. Another company vying for a DIA contract is Percipient.ai, which focuses on applying artificial intelligence to video. “This is a kind of capability that helps you get into productive analytics and helps you protect forces,” said company co-founder, ret. Brig. Gen. Balan Ayyar, a former U.S. Air Force intelligence officer who commanded a task force in Afghanistan. “You can check any person in any video,” he said. Ayyar and fellow Percipient.ai co-founder Raj Shah, say their platform can save analysts considerable time, for example scouring hundreds of hours of video from the scene of a terror attack to quickly identify if any suspected terrorists were nearby. “With this kind of system, the [terror] watch list could be much, much bigger,” said Shah, who previously headed up Google Maps. Already, Ayyar and Shah say Percipient.ai’s systems can identify suspicious activity, or tradecraft, like the use of specific getaway vehicles. For DIA, the early results have been promising. “We’ve seen examples when machines are able to provide insights to the analysts that they haven’t had,” said Randy Soper, a senior DIA analyst for analytics modernization. To speed up the process, DIA even awards seed money — up to about $250,000 — to projects that have shown the most promise. Two have already been approved and another four projects are set to receive funding once the once the money becomes available. More projects could soon be added to the list. DIA’s Innovation Hub is still considering the latest pitches from industry and academia, like those from SparkCognition and Percipient.ai. 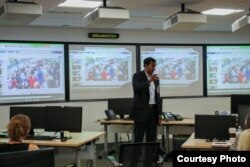 But the success in reaching out to industry and academia also has brought some changes to the program. Last week [August 22], the DIA opened up a new Innovation Hub. 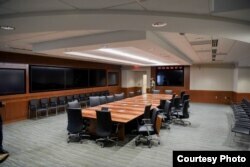 At first glance, it looks sleek and modern, a row of screens and a digital world clock etched smoothly into wood-paneled walls, while a large conference table dominates the center of the room. To be sure, it seems like quite a departure from the old iHub, which almost had the feel of a useful but makeshift classroom. Some things, though, have not changed. The wood-paneling only extends so far. Much of the rest of the room is covered in that white, glossy paint. “You can still write on the walls,” said one official.